Tuesday, Feb. 12, 2019, 12:30 – 1:20 p.m. The Tillman Military Scholarship supports outstanding active-duty service members, vets and military spouses who have great talent, significant leadership experience and a desire to enact positive change. 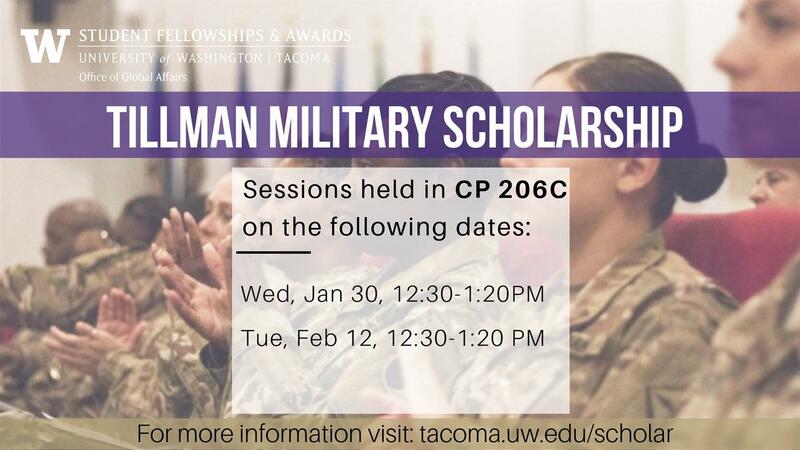 In addition to the financial award, it offers leadership training, access to the Tillman network, and professional networking opportunities. The Scholarship is named after former NFL player Pat Tillman who put his football career on hold to enlist in the U.S. Army. He died while serving in Afghanistan. Applicants must be active-duty service members, veterans or military spouses. The national deadline is TBA but will likely be March 1.